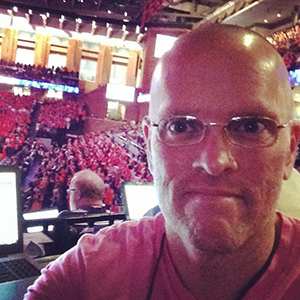 Scott German and I were wrapping up a Facebook Live recap of Virginia’s 68-51 win over NC State Sunday night when we heard a commotion from a luxury box nearby. You can see in the video that my eyes turn toward a big-screen TV in the box, not fulling understanding what I’m seeing. I could make out a guy in purple running down the sidelines for a touchdown, but we were roughly 12 minutes into a 14-minute video, and when we’d started, I would have sworn Minnesota was ahead of New Orleans, and I assumed by the time we were wrapping up had already salted things away. The emotion from the folks in the box told me otherwise, and of course, you know the rest. This story reminds me of a couple of other stories of fantastic finishes past. First was the Auburn-Alabam Kicksix game from back in 2013. I was in Scott Stadium covering a UVA-Virginia Tech game, which had wrapped up about a half-hour before the Auburn-‘Bama game went into its final moments. My wife, Crystal, texted me updates as I worked on my game recap and column, and told me that ‘Bama was setting up for a game-winning field goal. What was happening, I learned later, was that there was a lengthy replay review to determine if Alabama would have any time left on the clock to attempt the kick. I got lost in what I was doing work-wise, until a roar came from a few feet to my right. My seat in the press box at Scott Stadium is next door to the UVA radio booth, and Dave Koehn and Tony Covington were in a commercial break on their postgame show, with the Auburn-Alabama game on a TV overhead. The noise got my eyes from my laptop to the TV in time to see an Auburn player streaking like a guy running back a kickoff, which of course made no sense to me, because … wasn’t Alabama attempting a field goal? So, why would an Auburn player be returning a kickoff? One other story, which has me in Brooklyn on a Friday night in November 2014. I was covering the Virginia basketball team in a Thanksgiving weekend tournament, and game time coincided with the late kickoff for the Virginia-Virginia Tech football game. Crystal was with me on press row, which as you can guess was pretty sparsely populated, given the time of year, and the fact that the rivalry football game was ongoing. We kept our eyes on the game and had an iPad with the ESPN3 broadcast of the game to keep us up to date on what was going on in Blacksburg. As the final buzzer sounded on a UVA basketball win, the Hokies scored a late TD to take a 24-20 lead, and that seemed to be that. The postgame media situation was Crystal, a freelancer from the Daily Progress and me. It’s after 11 p.m., so the Progress writer is already past deadline, meaning … no rush. But, it’s par for the course that Tony Bennett, the Virginia coach, is punctual to a fault after a game. Tony almost always makes his appearance in the media room within about five to seven minutes after the end of a game. For comparison, you could wait as much as 45 minutes for Dave Leitao, who you didn’t really want to talk to anyway. On this night, though, five minutes passed, then 10. The three of us media types were watching the football game on my iPad, which we were to learn was running a bit behind with the ESPN3 transmission relative to the TV broadcast. We’d also soon learn that the UVA locker room was located immediately next door from the media room. As the iPad had Virginia on the minus side of midfield, we heard a loud roar come from the Virginia locker room. My immediate thought: UVA just scored a last-second touchdown to win the game. That’s why Tony is late getting to us. The team is watching the football game. The ESPN3 broadcast eventually caught up. Matt Johns had, indeed, ran in a long touchdown with about 40 seconds to go. But it got called back because of a procedure penalty. Virginia Tech, as you know, would go on to win, because Virginia Tech always beats Virginia in football. It was cool to learn that the basketball team cared that much about the football team that it had the game on in the locker room after a win. And for me, hey, for 30 seconds or so, I got to pretend that UVA had finally beaten Tech on the football field.